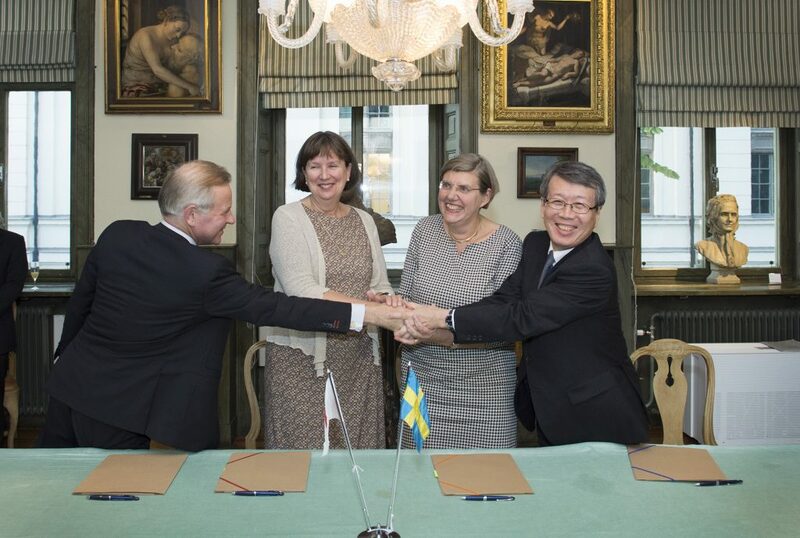 The University of Tokyo and Stockholm’s three major academic institutions – Stockholm University, Karolinska Institutet and KTH Royal Institute of Technology – have agreed to develop long-term cooperation. The Agreement that embodies the strategic partnership was signed in the beautiful setting of Spökslottet, or the Scheffler Palace, in central Stockholm on September 25th. Within this strategic partnership, the institutions will strengthen cooperation under the three headlines of research, mobility of students and staff, and development of faculty. The signing was carried out by Vice-Chancellor Ole-Petter Ottersen, Karolinska Institutet, Vice-Chancellor Astrid Söderbergh Widding, Stockholm University, Executive Vice President Masashi Haneda, University of Tokyo and President Sigbritt Karlsson, KTH Royal Institute of Technology (left to right above). After the signing followed dinner with the visitors from UTokyo and the universities in Stockholm and invited guests. The first major event within this partnership took place already the week before the signing. It was a workshop on Active Ageing that took place on 21-22 September in Nobel Forum. At the workshop, around 100 researchers from the four institutions met for a broad, multidisciplinary discussion on the challenge of the ageing population. Queen Silvia, who is very much engaged in the matter of ageing and the growing problem of illnesses like for example dementia that is brought with it, opened the workshop with a speech in which she pointed out that Japan and Sweden share a very similar situation in this urgent matter.